Cool Mint Listerine, 1.5L, back label, originally uploaded by dknNYC. It's been a few years since I've been called a "connections planner," so it always surprises me when I read about newly-founded "connections", "engagement" or "integrated comms" planning departments. This of course isn't saying that there aren't smart people doing good work as part of these teams. There are. BBH London's engagement planning team, for example, did some great work for Axe Clix, giving away free flirt counters to the adolescent men who bothered to send a text in. They also framed the numbers on the backs of London buses with big clicker frames, and did a lot of other ambient media that supported the creative idea. So it's not that "engagement planners" aren't valuable. It's that pretending this stuff constitutes a new discipline is a bit dishonest. About six years ago, Nick led a team of us - Stephanie, Francis, Lauren, and me - to create a set of connections planning tools for a big creative advertising network. (Is that a contradiction in terms?) Just two years later, after trying to invent a new discipline from scratch, the group split up for other agencies and other departments. Why? Looking back, I think that we came up with some clever ways of looking at communications problems, but in the end, there was no new discipline to be created. What we were creating were just good media planning tools, in the broadest, most creative sense. I think that there are some advertising snobs (and I was definitely amongst them until very recently) who thought that this was a lower form of "the new discipline". I remember sniffing at "mere amplification" as I had another sip of port and puffed on my pipe (all metaphorically). But there's nothing wrong with getting attention in an entertaining and engaging way. Are we so ashamed of the art of advertising that we have to be clever first and beautiful second? I can say now, unequivocally, that the nerds won't inherit the Earth. Creative rightly rules. There have been some interesting ideas that have had as much to do with the media involved as with the creative words and pictures (which our industry badly brands as "Big Ideas"). Some of these include Tribal DDB London's Monopoly Live last year, which turned London into a GPS Monopoly gameboard with taxis as the game pieces. These are indeed very good when executed properly, but the danger lies in the times when marketers start with a media opportunity first and end up with bad media planning that reaches nobody and engages no one. If you're going to start with media opportunities first (and not with creative work) then you've got to be really disciplined. Since you're not leading with entertaining copywriting or art direction, what you're going to do had better be relevant and to the point. One example I like to use is the back label for 1.5 litre bottles of Listerine. The problem for Listerine is that it's a mouthwash. Mouthwashes aren't generally under patent anymore. The retailers know this and everyone from Target to Wal-Mart to CVS sell their own store brand knock-offs right next to Listerine. What are you going to do as a marketer? Maybe another floor sticker, or a "shelf talker"? How about skywriting? No. Someone at Listerine must have researched the problem and worked out a strategy. 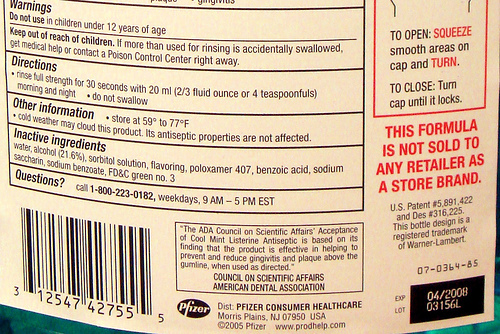 Next to the list of ingredients is, in red, the message, "THIS FORMULA IS NOT SOLD TO ANY RETAILER AS A STORE BRAND." It's in the right place: next to the ingredients where the bargain shopper might be looking to see if the store brand has the same ingredients. It has the right message: no store brand has the same formula as Listerine. And it's targeted correctly. This message only appears on the back of 1.5L bottles. It doesn't need to be on other sizes because the retailers haven't bothered to hit the smaller convenience sizes of Listerine (yet). The battle is for people who buy big bottles and want to save 30 cents over the course of three months. Anyone who is paying an extra few cents per ounce for a convenience size isn't checking the back label for ingredients. In the cases above, you'll notice no fancy communications theories or diagrams. It's the basics: be entertaining, engaging, relevant, efficient, or any combination of these. The result could be a creative amplification, communications idea, or media idea; it doesn't matter as long as it works. It also doesn't matter who came up with the right communications vehicle. Media planners should be closest to the problems and therefore closest to the answers, but just in the examples above, we've seen ideas from engagement planners, digital planners, media planners, and clients. As long as someone is keeping track of how people end up interacting with the communications program, things should work out. I have one final question to close out this entry. Does anyone know who actually came up with that small message on the back of the 1.5 litre Listerine bottle? I owe him or her a thank you for giving me a little hope for our profession.